Most consumers – whether insured through their employer, the individual market, or government programs – have set copayments for their prescription drugs, an out-of-pocket expense they pay at the pharmacy counter. An inherent assumption in this framework is that the patient and insurer are sharing the total cost of the drug. A new Schaeffer Center study finds that this is frequently not the case. In fact, the study found in almost one in four prescription claims analyzed, the copayment the patient paid was actually greater than the cost of the drug to the patient’s insurer, with the average overpayment $7.69. “Our study sheds light on what many had assumed to be an uncommon practice, and finds that overpayments may occur much more frequently than we realized,” said lead author Karen Van Nuys. “These findings have implications for patient’s out-of-pocket spending as well as national drug spending trends.” Van Nuys is a research assistant professor at the USC Price School of Public Policy and executive director of the Schaeffer Center’s life sciences innovation project. The study was published as a white paper by the USC Schaeffer Center and a research letter was published by JAMA on the findings. Analyzing prices paid for prescriptions is notoriously challenging due to a lack of publically available data and transparency in the rates negotiated. Van Nuys and her colleagues compared the national average retail price identified by reimbursement data from a survey conducted by the Centers for Medicare and Medicaid Services with patient copayments from a dataset of pharmacy claims provided by Optum Clinformatics. The data analyzed, which consisted of 9.5 million claims, were from the first half of 2013. To ensure the overpayments identified were not due to a data error, the researchers identified claims in which the copayment exceeded the reimbursed amount by more than $2.00 for reimbursements below $20 or 10 percent of the reimbursement for reimbursements above $20. In terms of both frequency and magnitude, the overpayments identified were substantial. According to their analysis, almost 23 percent (or 2.2 million) of the claims analyzed involved overpayments. Not surprisingly, they occurred more frequently on generic drugs than branded, 28.17 percent compared to 5.95 percent. These overpayments were for commonly prescribed drugs including antibiotics, statins, anti-hypertensives, sleep aids, anti-inflammatories, and cough and cold medications. Furthermore, of the 20 most frequently prescribed drugs in 2013, 15 involved overpayments more than 10 percent of the time, and nine involved overpayments more than 40 percent of the time. In terms of magnitude, the average overpayment was $7.69 though almost one in five overpayments exceeded $10. Sixty percent were worth $5.00. Though most overpayments are relatively small on a per-prescription basis, the frequency with which the practice occurs on drugs for common conditions magnifies their impact. The authors estimate that in their dataset alone, total overpayments were worth over $135 million in 2013, or $10.51 per member per year. The authors note that many U.S. patients struggle to afford their out-of-pocket costs, and cost-related medication non-adherence is common. Non-adherence can lead to additional medical complications, poorer health outcomes, and thus higher medical expenditures. Of the 20 most frequently prescribed drugs, six had average overpayments greater than $10. 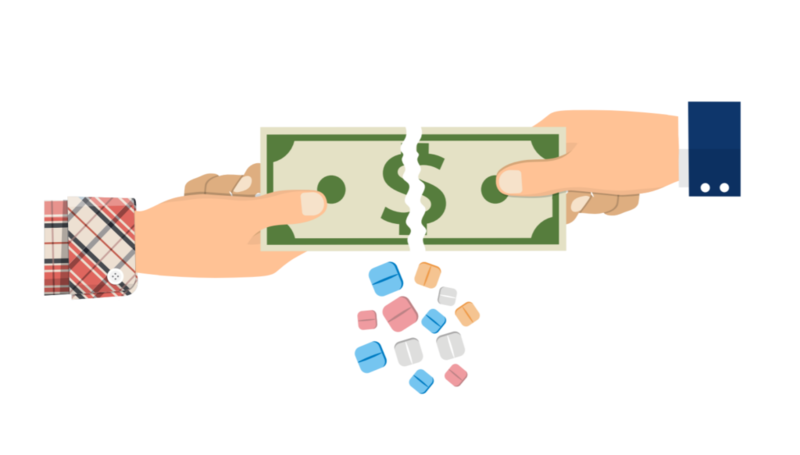 The authors note that a number of states have already banned the practice of overpayments in addition to a handful of states which have banned gag clauses that prevent pharmacists from telling patients when their copayment exceeds the cash price of their drug. Given the findings in this study, these policy approaches are a move in the right direction. Importantly, the survey of national average retail prices the authors used to examine the frequency and size of overpayments is now discontinued. The authors note that without data and transparency, it is hard to identify trends in drug pricing and issues like overpayments. Reinstating the survey, or a variation of it, would enable researchers to better assess these important trends and provide insight for policymakers to implement evidence-based policy. Additional coauthors of the study included Dana Goldman, Leonard D. Schaeffer Director’s Chair and distinguished professor at USC, and Rocio Ribero, USC Schaeffer Center project specialist. The study was supported by the USC Schaeffer Center for Health Policy & Economics and by the National Institute on Aging of the National Institutes of Health under Award Number PO1AG033559.